Professional athletes are the strongest, most talented performers in their field of work. We respect them, admire them, and sometimes envy them. So when clothing errors happen, we take it upon ourselves to revel in an of their misfortunes. Janet Jackson coined the phrase, and now we are celebrating the best in athletic fashion blunders with this list of infamous errors. Feast your eyes, feasters! Russia's Olga Graf celebrates after wining the bronze medal in the Women's Speed Skating during the Sochi Winter Olympics...but she unzipped her uniform a bit too low and almost had a wardrobe slip-up. She recovered quickly. Olga Graf was born on July 15th, 1983, in Omsk, Soviet Union. She started speed skating in 1995 because her martial arts instructor suggested she try it. The 2014 Olympics was the culmination of years of preparation, as she made her professional debut at the 2007-2008 World Cup. But of course, no amount of success will dissuade the media from talking about her flashing moment. 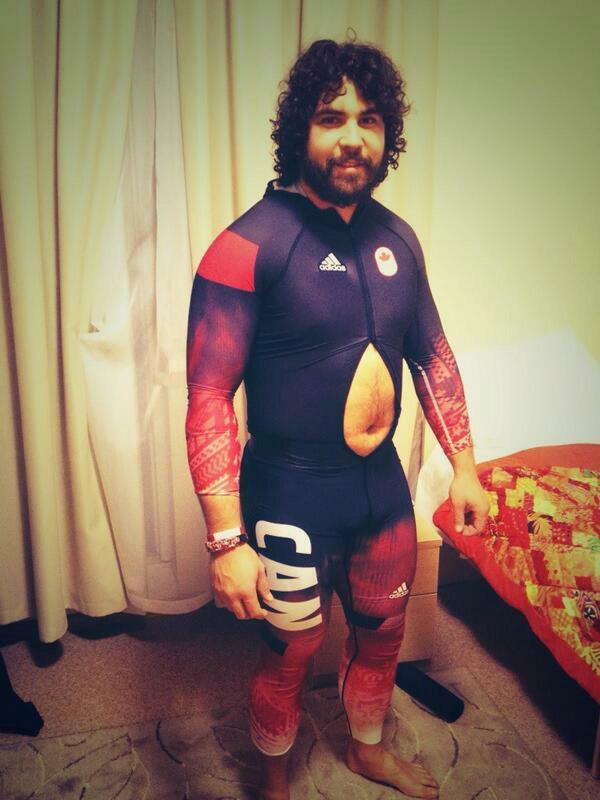 Bobsledder Christopher Spring tried on his suit a day ahead of his Olympic race, but it came out a little tight. In good humor, he took the time to post this fascinating picture to Twitter so the world could witness his hairy belly. In fairness, we've all experienced an awkward zipper mishap. Christopher just chose to make his public. Kudos sir!